The following newsletter was emailed in April 2013. Any offers, specials or prices presented are no longer applicable. If you would like to be kept up to date and see current offers, please sign up for our newsletter! If you have considered replacing your current furniture, purchase new or adding pieces to an existing collection this newsletter is for you. We are offering the Lowest Prices of theYear on many of our Best-Selling collections! Exceptional quality, endless options, superb customer service and now even Lower Prices! Highlighted below are only a few of our favorites, so be sure to check out our April Flier for more ways to save! The Empire High Back Dining Set is contemporary and super comfortable. Outdoor quality UV resistant resin is 100% hand woven over all-aluminum frames built for years of entertaining and will not rust! Specially designed to withstand sun & storm, the highly flexible, extremely strong synthetic wicker strands are engineered to endure harsh UV rays maintaining their color, texture and strength season after season. The above featured Empire 7-Piece Dining is now only $999.99, was $1189.99. The Kokomo Sectional is engineered for maximum durability. The extremely strong, synthetic UV resistant wicker strands are hand woven over powder-coated all-aluminum frames that will not rust! 100% finished, welded and woven by hand to create a true artisan collection. Include our hand tailored made in the USA cushioning and you've got yourself one dynamic collection. Elegance, durability and ultimate style! The above featured Kokomo Sectional is now only $2378, was $2578. Optional toss pillows are $29.99 - $39.99 each. The Islamorada Collection combines a classic, simple style with high back comfort! The fine art of furniture making from sustainable all-natural wicker and rattan is a time honored skill that has been passed down from generations of craftsmen in the Islands of the South Pacific. The individual time and pride invested in each piece gives it a one of a kind beauty that adds meaning to your living space. Handmade from beginning to end, the wicker and rattan frames are designed with comfort as a top priority. The super cozy high back cushions provide a soft touch and ultimate comfort for years to come. The above featured Islamorada High Back Sofa is now only $849.99, was $979.99. Have you been looking for quality replacement cushions in specific measurements for your existing furniture? Maybe you are not ready to purchase a new set of furniture but would like to update the style or color. If you can relate then our Perfect Fit™ program will perfectly fit your needs! Custom crafted replacement cushions are made locally in Largo, FL to YOUR measurements and produced in the shape, style and fabric YOU select. We have over many styles to choose from including Universal Cushions, Add-A-Pad, Seat Cushions and Deep Seating Cushions and over 250 fabric options. You provide us with the measurement and our expert pattern makers and seamstresses will create your Perfect Fit™ cushion in 4-6 weeks. 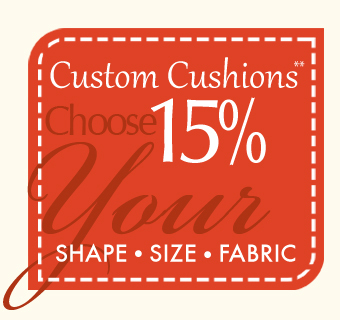 Offer valid on any custom cushion by Perfect Fit™. Must present coupon at time of purchase. Prior sales excluded. Limit 1 discount per customer. Cannot be combined with other offers. These deals are only available for a limited time only so stop by Your Local Showroom and talk to one of our furniture experts. Do it Now before the sale ends on 4/30/13!